I had a big clearout of my cabinet and makeup bag before I began this process as cosmetics, as food, have a shelf life. There were a few bits and pieces I ended up binning, because they had separated, smelled funny or had just been in my collection for years (literally years in some cases) and I definitely didn't think it would be wise to put that on my face! What I am left with is a rag tag collection of half used products which I am now aiming to finish up - I pretty much have everything I need, so there really is no cause to buy anything else for now. 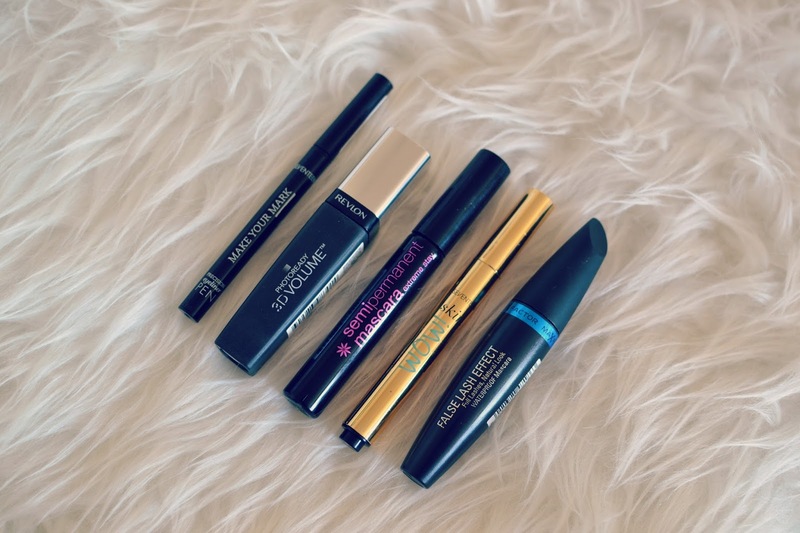 A couple of mascaras to talk about too - the InVogue one was pretty good, it claimed to be a semi-permanent mascara but I couldn't fathom it made any difference to my lashes, and it came off easily with makeup remover. The brush was bristle, though, which I much prefer to plastic; the Revlon one had a plastic brush and it was just awful. I slogged through on this one for a few weeks but was so pleased to get to the end of it; it didn't really do anything for my lashes and it also transferred across to my brow bone (a pet hate) so I definitely wouldn't consider using it again. The last mazzy was this False Lash Effect from Max Factor. I didn't rate this at all - I took it on holiday as it was waterproof so I thought it might be useful but it made my lashes the crispiest they've ever been and it would not come off. I used it for the first couple of days and it was still hanging on by the end of the holiday, despite trying to remove it with wipes, soap, oils....it was having none of it. Waterproof? Nuclear fallout proof more like. As soon as I got home this went straight in the bin. Something I did like was this Seventeen skin WOW concealer. The most obvious dupe for YSL Touche Eclat I have ever seen, it is practically identical in terms of product and packaging (I've had a Touche Eclat in the past) and it was pretty good and costs less than a fiver, but I've since switched back to an old faithful concealer/highlighter so I probably wouldn't rebuy this.